Many believe the Abyssinian to be direct descendant of the sacred cat of Egypt; however the exact origin of the breed is obscure. Certainly, there is a strong resemblance between the modern Abyssinian and the cat depicted in ancient Egyptian bronzes, paintings and the agouti-coated cats found buried in the tombs; with their long body, large ears and tail. 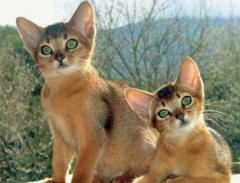 The Abyssinian is an affectionate intelligent cat, people-orientated and extremely active. They thriveon interaction and play. They are not constant lap cats; rather, they need to know what you are doing, help make phone calls, read your newspaper or make your bed. In fact they insist on being included in all family activities. Abyssinians make good family pets, but prefer adults and older children rather than toddlers. They are not vocal; having a small bell like voice. They prefer to sleep in higher places like backs of chairs, refrigerators and scratching posts. Once a relationship is formed there is no breed more loyal then the Adyssinian. We are open Wednesday & Friday evenings for your convenience. We offer free weekly delivery of food and prescriptions to all areas of Wasaga Beach, Elmvale and Collingwood! Call or email with your order by Monday at 6pm, for delivery on Wednesdays!